When I gaze (lovingly) on the embroidered petals of these pinks, I feel transported to an earlier time, perhaps to the early Victorian age when it was called Japan Pink. Large single flowers in white, pink and red shades have contrasting stitchery and jagged pointed petal edges. A cool season annual. Listed in an American seed catalog in 1903. Tall spires of pendulous bell-shaped flowers bloom late spring to summer. Described by Helena Rutherfurd Ely in 1903 as "the pride of the garden. 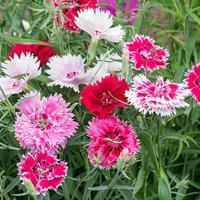 Plant them back of the Sweet Williams, in clumps of six or eight, or else with peonies. They blossom at the same time, and the pinks or reds of Sweet Williams or Peonies, ...and the tall, graceful spikes of the Foxgloves rising above them, produce so beautiful an effect that you will simply have to go and look at them many times a day." This beautiful white-flowered form, when grown with the purple form, can result in soft pink flowers from self-sown seeds. Late spring bloom. Self sows. Latin Name: Digitalis purpurea hyb. 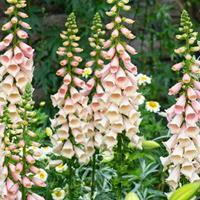 A hybrid foxglove with towers of swoonworthy peachy blooms that slowly fade to creamy pink with freckled interiors. A huge plus: it will bloom the first year from an early indoor sowing, unlike traditional varieties. Compact and upright, it is right at home in the exuberance of the June border. Remove faded flowers and avoid wet winter soils to encourage a following season of bloom. Biennial to short-lived perennial. Mrs. M. Grieve in the Modern Herbal (1931) recounts the folklore of the foxglove, "The Foxglove derives its common name from the shape of the flowers resembling the finger of a glove. It was originally Folksglove - the glove of the 'good folk' or fairies, whose favourite haunts were supposed to be in the deep hollows and woody dells, where the Foxglove delights to grow. àthere is a northern legend that bad fairies gave these blossoms to the fox that he might put them on his toes to soften his tread when he prowled among the roosts. The mottlings of the blossoms of the Foxglove and the Cowslip, like the spots on butterfly wings and on the tails of peacocks and pheasants, were said to mark where the elves had placed their fingersà" We salute the long history of foxgloves in gardens by renaming this intricately spotted variety 'Fairy Bells'. Poisonous. It’s amazing the way spires of foxgloves shoot up through mounds of bellflowers, clouds of hesperis, dangling columbines and other spring cottage garden classics, enhancing each of these in turn, and amping up the whole. ‘Sugar Plum’ has ample flowers of lavender with blackberry jam throats. Hummingbirds love them! Biennial to short-lived perennial. It’s amazing the way spires of foxgloves shoot up through mounds of bellflowers, clouds of hesperis, dangling columbines and other spring cottage garden classics, enhancing each of these in turn, and amping up the whole. ‘Sugar Plum’ has ample flowers of lavender with blackberry jam throats. Hummingbirds love them! Biennial to short-lived perennial.Biennial to short-lived perennial. 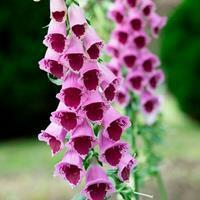 I offer the original strain of this deliciously colored foxglove introduced soon after 1900. It is especially good in combination with buff colored roses and sweet rocket. Late spring bloom. Self sows. The original species, called Antwerp Hollyhock, was yellow. I offer here a natural hybrid between this species and A. rosea. Yellow, copper, rose, red, burgundy-purple and white single saucer-shaped flowers bloom along the tall stems. A biennial to short-lived perennial, it persists for years and is also much less susceptible to rust than other species. The epitome of an old-fashioned flower, it looks best in informal settings, grown against old outbuildings and fences in masses. Listed in a book of 1833. Summer bloom. 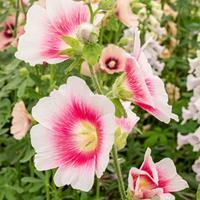 Huge saucers of blooms in mouthwatering shades of old-rose, shell pink, cream and more put on a flower show all summer, opening from the bottom of the tall stems to the top—often way above your head, very unlike those unfortunate stubby modern kinds. Perfect sited along a split rail fence, their numerous flowers a haven for bumblebees. Apricot pink saucers with blackberry centers open from the bottom to the top along tall spikes for months in summer. A new variety, bred for branching habit, long bloom time, perennial tendencies and all over gorgeousness! Avoid wet winter soils. Biennial to short-lived perennial. 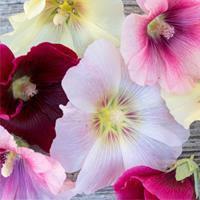 The epitome of the cottage garden flower, hollyhocks have now been improved by years of dedicated breeding in England. The Halo series of multicolored, large-flowered hollyhocks are great vertical accents at the back of the border, screen anything you don’t want to show off, and look cottage garden perfect with a fence or shed as a backdrop. 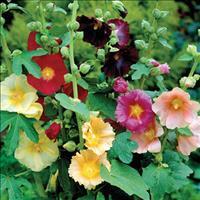 A biennial to short-lived perennial to sow in spring to summer. 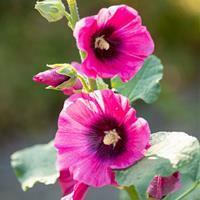 A long-blooming, branching new hollyhock with loads of satiny saucer-shaped blooms in deep rose with purple centers. 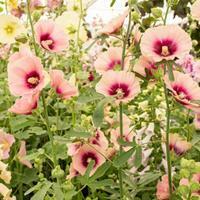 Easy to grow, it is cottage garden perfection beside a weathered barn-board shed. Avoid wet winter soils. Biennial to short-lived perennial.